Mill images collected from other web sites and sources. Bunker Hill Mill, Bunker Hill, West Virginia. 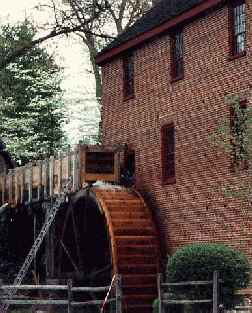 Meadow Run Grist Mill, Monticello, Virginia. 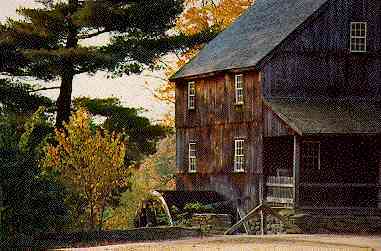 Wright Grist Mill, Old Sturbridge Village, Sturbridge, Mass. Sawmill, Old Sturbridge Village, Sturbridge, Mass. Mill Springs Mill, Mill Springs, Kentucky . Colvin Run Mill, Great Falls, Virginia. Glade Creek Mill, Babcock State Park, Clifftop, West Virginia. The Watermill, Little Salkeld, Penrith, Cumbria, United Kingdom. The oldest mill in the State of West Virgina. Two Tandem Fitz Water Wheels. Meadow Run Mill is part of the Michie Tavern (circa 1784) complex, moved, and reconstructed, the Meadow Run Mill, once located at Laurel Hill, Virginia. Plans for the mill were drawn up in 1764, and construction began in 1770, but the mill structure was not completed until after the American Revolution. 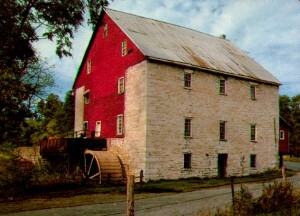 The mill operated until 1958. In 1974, the Meadow Run Mill was purchased and moved to this site by owners of Michie Tavern (circa1784). The addition to the left of the first floor stone foundation is a gift shop. The mill has one of the best examples of a complete cast iron I-X-L Overshoot Water Wheels. The predates the year 1902 before the company's name was changed to the Fitz Water Wheel Company. The wheel is turned by artificial means having no natural flow of water on this site. Behind the water wheel in the wheel pit, is a device that is very much similar to the workings inside of a toilet tank. A float moves up and down in a shallow pool of water below the wheel. It allows the rising water to exit down through a value into a recirculation pump that carries the water to the top of the sluice box at the right just out of the picture. Old Sturbridge Village constucted this new mill in 1938. Machinery from Porter Grist Mill, Hebron, Connecticut. Millstones & orginal waterwheel from Grist Mill, South Egremont, Mass. The world's largest metal water wheel: The Lady Isibela is 72 & 1/2 feet in diameter. The largest water wheels (wooden) in the world are the Noria Water Wheels in Syria & Jordan some of these wheels are 90 feet in diameter. A 20 foot diameter overshot wooden water wheel. 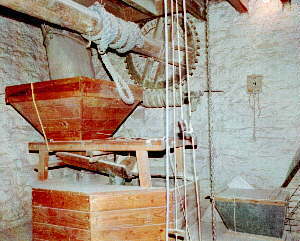 A Oliver Evans automated mill with 3 pairs of millstones. A cannibalized mill constructed from mill parts from 3 grist mills. The mill was created by combining parts and pieces from several old mills which once dotted West Virginia. Cooper's Mill operated on Glade Creek long before Babcock became a state park. 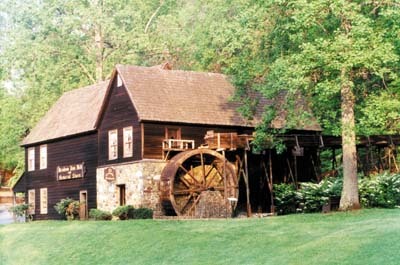 The basic structure of the mill came from the Stoney Creek Grist Mill which dates back to 1890 and was dismantled and moved piece by piece to Babcock State Park. 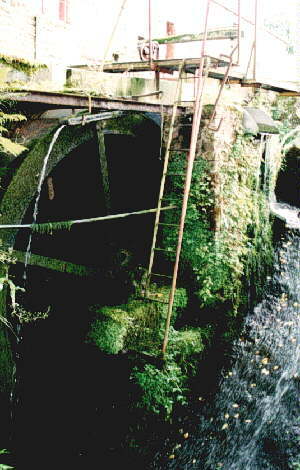 The mill has a Fitz Water Wheel but the water is applied too far forward on the water wheel, and a lot of power is wasted. traditional methods. The term "corn," in English word for grain. A mill grinding corn in England usually means a mill that grinds wheat. In England corn is called maize and mainly used for animal feed. 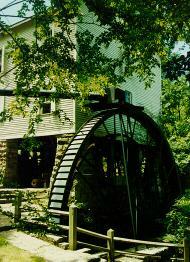 The English use the term "watermill," similar the the way in America we use the term "grist mill." Interior of the mill: the millstone floor, showing the millstones with their cover, the vat (English term tun). A worm gear spur drive in above the millstone hopper against the far wall of the mill.